I didn't blog about my beauty based new years resolutions at the beginning of the year as I only had two (it's now increased to four!) but one of them is to start being more adventurous with my hair and the products that I use. I tend to wash it and then either straighten it or tie it back if I've left it to do it's own thing, and that's about it. One of things I do want to try and experiment with this year is finding more volume. When left to dry naturally my hair isn't short on volume through the mid-lengths to the ends, but this is due to frizz and once straightened my hair becomes very flat. Another thing I do worry about is that at some point my hair has become thinner. As you may be aware I used to have very long hair that was naturally blond but three years ago I cut it all off to shoulder length and dyed it what should have been chocolate brown but pretty much ended up being black. It may be an illusion because my skin is very pale and I've been used to blond hair for most of my life but when I look at my scalp now I'm concerned by how much of my scalp I can see through my hair. So when I saw that L'Oreal were releasing a new hair care range aimed at creating thicker hair that appeared to be creating a bit of a buzz you could say I got a little bit excited. I apologise for the stock image but I'm currently at my boyfriend's house and the chance of being able to take a picture I'd be happy to put up on my blog is non-existent so I've borrowed an image from L'Oreal. I signed up to the Boots waiting list to be notified when this was released and when the email hit my account a week and a half ago I headed straight to my nearest store. I wasn't surprised to find that it hadn't actually made it's way to store yet and after several trips to a couple of different stores I finally found it yesterday. The range is currently on offer in Boots on 3 for £10 so I grabbed a shampoo, conditioner and the Thickness creation serum and the offer saved me just under £5. I'm not sure if I'll try the Thickness booster as the reviews I've seen so far have complained about how much product you're apparently supposed to use and how little is included is included in the tube. I think I will probably grab the mask at some point in the future though. So what is special about this range is that L'Oreal have apparently been working on it for many years and it contains something called Filloxane. This actually penetrates the hair fibre and then expands to thicken the hair. This then remains inside the hair fibre, it isn't washed away when you rinse, and over time your hair will look thicker and thicker as you continue to use it. As the name of the post suggests this is just a first impressions post as I mainly wanted to introduce the range and let you know it's currently on offer if you want to try it for yourself. However, I did give this a try for the first time last night and on first impressions, I love it! I only used the shampoo and conditioner, just to get a feel for them before trying the serum, but today I have soft, bouncy hair that generally just looks really nice. Although I couldn't say for definite that my hair was any thicker after just one use it did actually feel like it was to me and I'm really looking forward to seeing how it develops over time. I intend to just use these products (and obviously heat protection if I'm using heat) for a couple of weeks and then I'll report back with how I'm getting on. 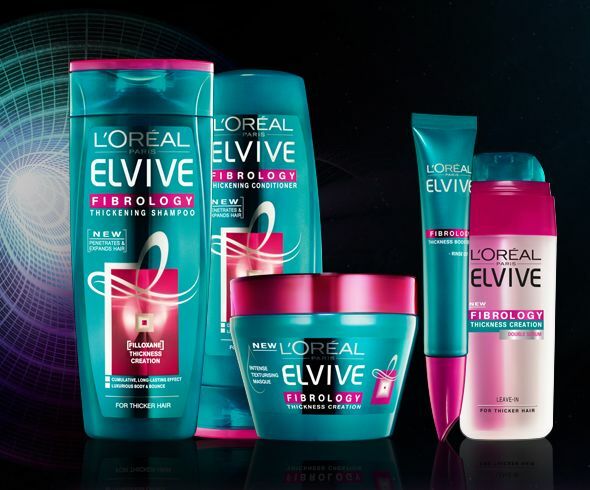 Will you be giving L'Oreal's new Fibrology range a try? Oooo I have fine hair so I'm very tempted to try this range of products! I have awful fine hair and I can see my scalp which I constantly worry about and I have tried the shampoo and conditioner and they are great. My hair is shiny and I feel as if there is more of it, I also have the mask but after reading reviews about the serum where you have to use 1/2 of the tube at each wash I will give it a miss. The shampoo and conditioner alone have made a vast improvement to my hair so if you have thin hair try this product. The shampoo and conditioner are £4.00 for both at Superdrug this week.